Holy water (Theertham) : Agni Theertham. Sacred Tree (Sthala Vriksham) : Purasamaram. This is the 36th sthalam on the northern side of river Cauvery. Appar has sung hymns in praise of Lord Shiva of this temple. Lord Sukran is the first among the most beneficial Navagraha. We can easily say “Sukra Yogam” has started to a person, when suddenly prosperity and luck comes to him. Lord Sukran is the authority to gift a human with luck and worldly pleasures in exchange of his good deeds in his previous birth. 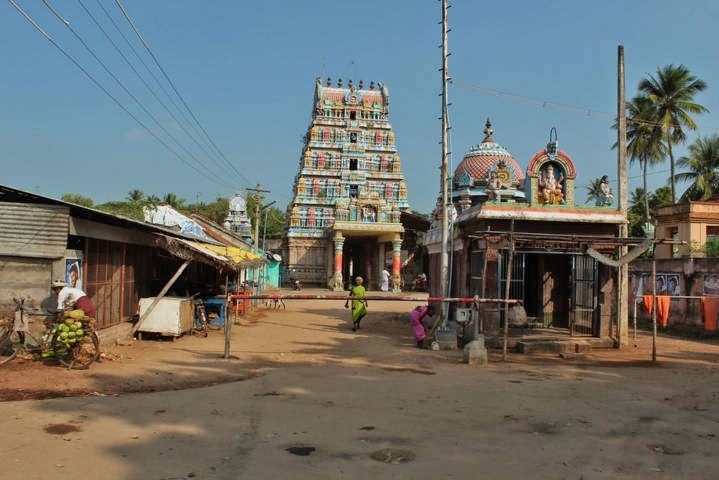 Kanjanur Sukran temple is near Kumbakonam in Tamilnadu which is visited by devotees as “Pariaharam” for Sukra Dosham. 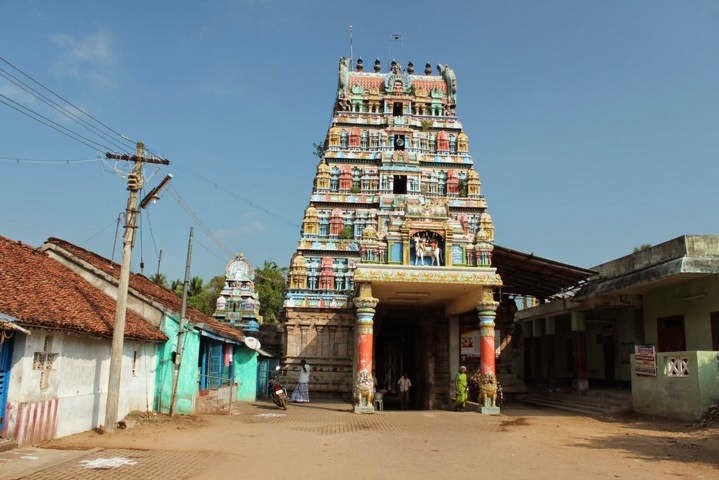 Kanjanur is the temple for performing “Kalathira Dosha Pariharam” for Lord Sukiran. 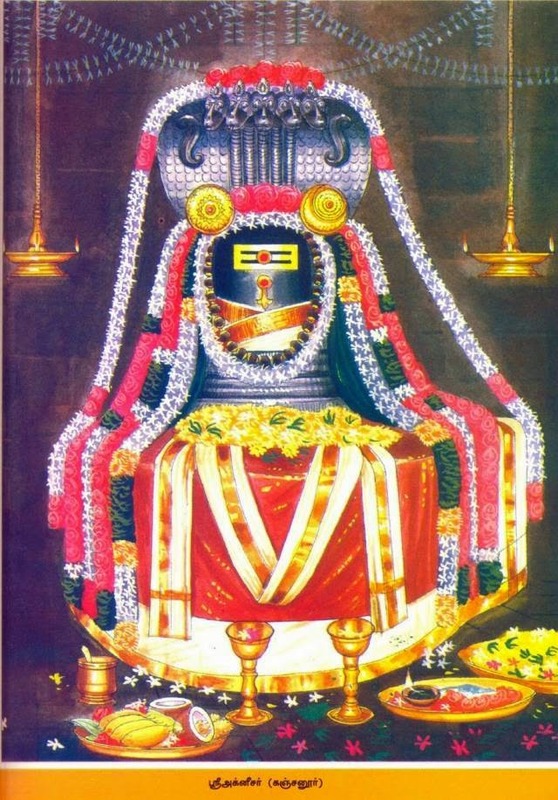 Lord Shiva named as Agneeswarar is the presiding deity and his consort is Goddess Karpagambal. Lord Agni one of the “Ashtadhik Balakars” is said to have worshiped Lord Shiva here and hence the name Agneeswarar for the Lord Shiva here. There are quite a few Shivalingams in the praharam, including one supposedly installed by King Kamsa. Lord Dakshinamurthy (Guru) is always seen with a demon being crushed under his feet. The demon signifies ignorance. It means that Dakshinamurthy leads us from ignorance to the knowledge of self. Instead of this standard practice, you can find the image of Haradatta worshipping Dakshinamurthy, which is a unique feature of this temple. 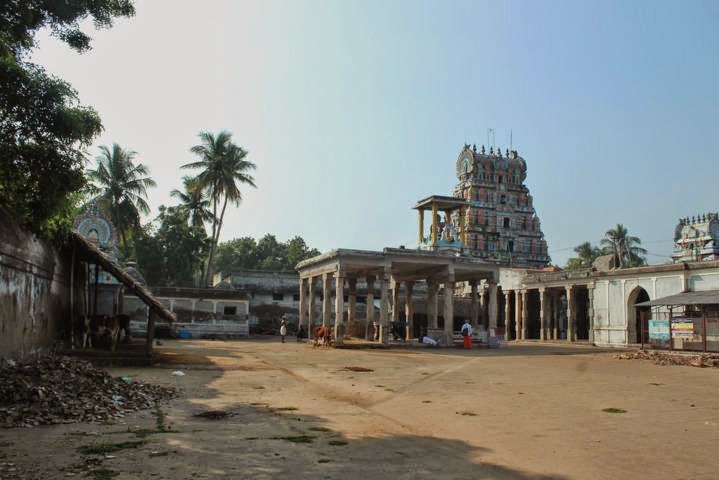 Agneeswarar Temple at Kanjanoor or Agniswara Swami Temple at Kanjanur is one of the nine Navagraha Temples in Tamil Nadu and is associated with Lord Sukran (Planet Venus). 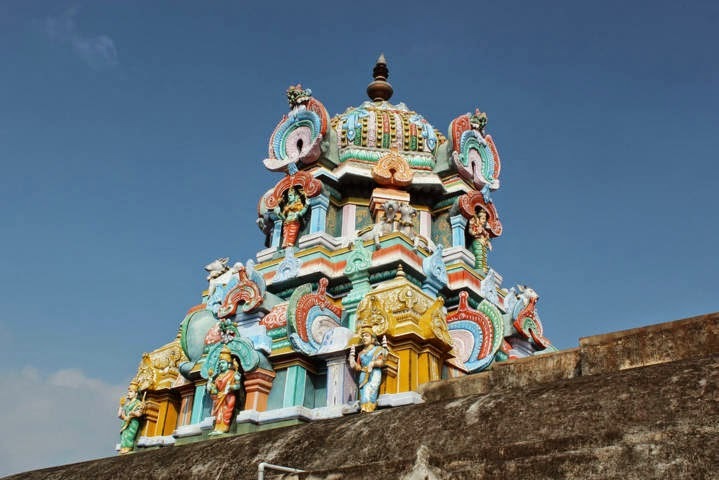 Also known as Sukran Navagraha Sthalam, Agniswarar temple is located around 18 km from Kumbakonam and 2 km to the east from Suriyanar Kovil, on the “Kallanai – Poompuhar” road, in Tamilnadu. As per the Temple story (Sthala Purana), Lord Brahma was blessed with a vision of Shiva’s marriage with Parvathy here. The Brahma Lingam enshrined in this Temple is said to have been worshipped by Lord Brahma himself. There is no separate sannidhi (shrine) for Lord Sukra as Lord Shiva himself is believed to have incarnated as Venus here. Brahma is said to have been blessed with a vision of Shiva’s marriage with Parvati here. 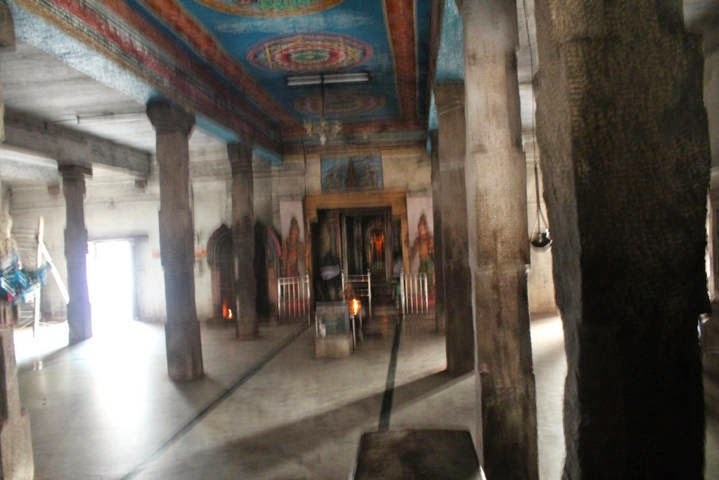 Lord Agni Bagavan is said to have worshipped Shiva here, hence the name Agneeswarar. Haradatta Sivacharayar, originally a Vaishnava by the name of Sudarshana underwent great ordeals to prove his devotion towards Shiva to his fellow Vaishnavites here. There are a number of images in the temple Pragaram relating to his story and the ordeals he underwent. Images of Agneeswarar and Karpagambal are also seen in the Varadarajar Temple at Kanjanur. 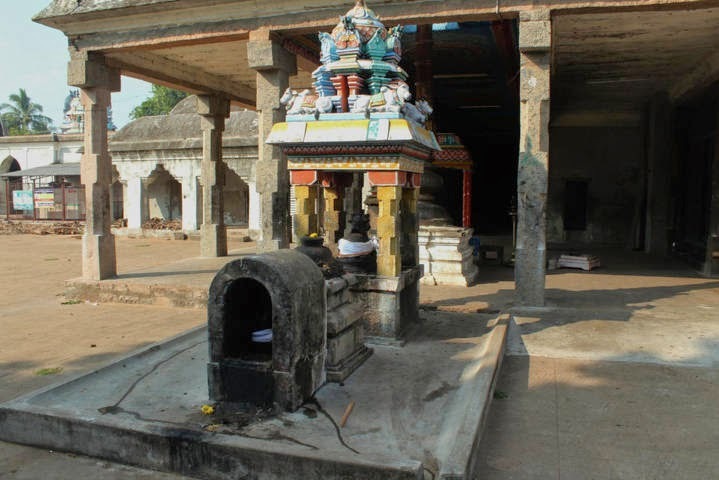 Several legends pertaining to events in the life of Haradatta Sivacharyar pertain to this shrine. The Nataraja Sabha is referred to as the Mukti Mandapam and the Shiva Tandavam here is called as Mukti Tandavam. Legend says that Lord Shiva blessed Paraasara muni (Parasara Muni is the father of Vyasadeva and the author of Vishnu Puranam) with a vision of the cosmic dance – Mukti tandavam here. Located on the northern banks of river Cauvery, Kanjanoor Agneeswarar Temple or Kanjanur Agniswara Swami Temple is built with two prakaram. A five tiered Rajagopuram is seen at its entrance. Other deities worshipped here are Maanakkanjaarar, Nayanmaar and Kalikkaamar. 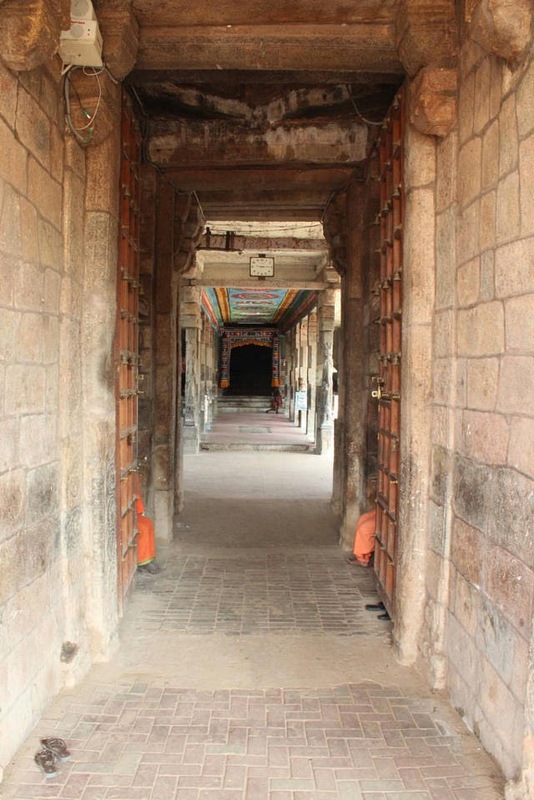 Images that describe the stories relating to Haradatta Sivacharyar of Vaishnava origins, inscriptions from the Chola and Vijayanagar periods, and stone images of Natarajar and Sivakami are seen in this temple. 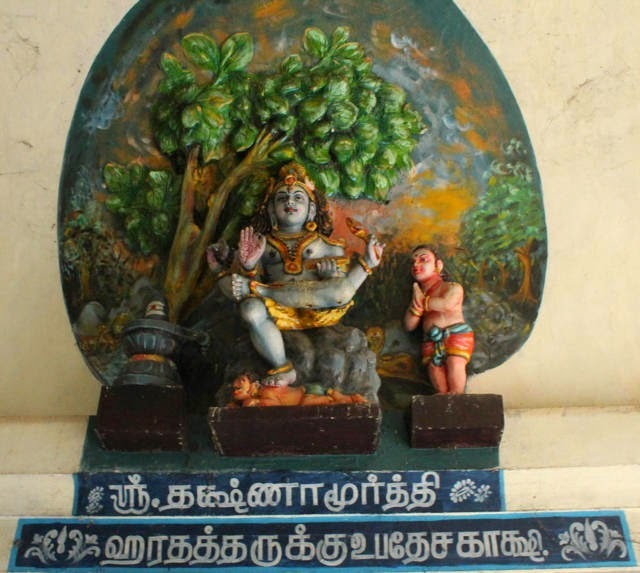 This shrine is also referred to as Palaasavanam, Bhrammapuri, Agnistalam and Neelakudi. 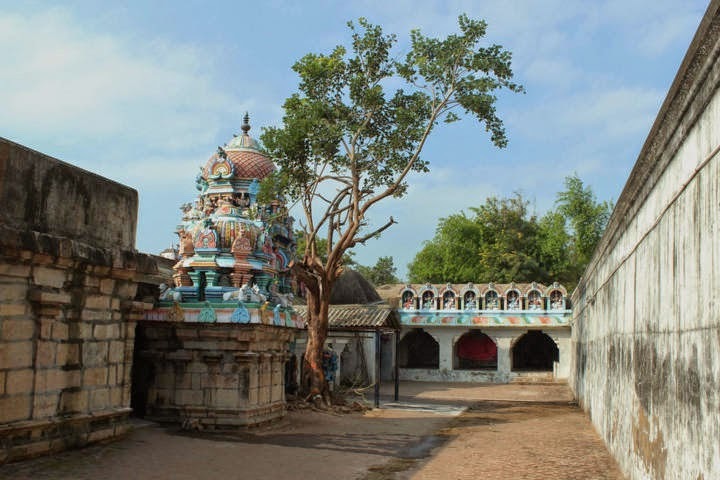 This Kanjanur Siva Temple is considered to be the 36th in the series of the “Thevara Stalams” located in Chola Nadu north of the river Cauvery. Haradatta Sivacharyar is said to have composed many works in Sanskrit here. There are also shrines to Maanakkanjaarar Nayanmaar and Kalikkaamar here. Inscriptions from the Chola and Vijayanagar periods are seen in this temple. Appar is said to have visited Kanjanur on his way to Tirukkodikka from Edirkolpaadi. Sukra Pariaharam: Lord Sukkiran is the second most beneficial planet after Guru. Lord Sukran is the Guru (Teacher) for Asuras. Sukra dasa acts in one’s life for twenty years after Ketu dasa. As the length of this is largest, if Lord Sukran is placed in a good house, those people running Sukra dasa gets peaceful and leisurely life. They earn money by doing little things and wherever they set their foot they grow huge. For many people Sukra dasa period is the major breakthrough in their life. Beggar becomes a milliner and milliner becomes a beggar. Both are in the hands of this great Lord in charge of the money, wealth, marriage, women and enjoyment. The dasa and bukthies of Sukran is very important and must be carefully watched. Sukiran is the “Kalathira Karaka” in Indian Horoscope system, meaning he is the deciding authority to favor one’s marriage proposals as well happy married life. Often people with the blessings of Sukiran in favored houses in their horoscopes get married at the younger age without any difficulties and get their most suitable life partner. If Lord Sukran is not placed well in one’s horoscope, they get their life partner with great difficulties and often unhappy about their suitability. Those peoples must visit this temple and perform suitable Parihara Pooja to get remedies and reduce the ill effects. If marriage gets delayed you must thoroughly check your horoscope with an astrologer and find out if you have any Kalathira Dosham due to Sukiran. If Sukran is favorably placed in a person’s horoscope, they will be blessed with prosperity, beautiful wife, own house, vehicle, fame & marriage. The person will also be very influential. An unfavorably positioned Sukran in ones horoscope causes eye ailments, indigestion, and impotency, loss of appetite and skin problems. Lord Sukiran is offered white Lotus, white cloth, mochai kottai (common bean) and aththi (fig) to alleviate problems caused by Sukra dosham. Friday is the day of Sukran and worship on Fridays is considered very special. Sukiran is also Ambal’s favorite and the special day for Ambal is Friday as well. Six worship services are offered daily in this temple. Fridays are considered auspicious to pray Lord Shukra. Story of Vamana Avatar and Lord Sukaran: King Mahabali, the grandson of Prahlada was a great king. He performed a sacrificing Yagna called `Viswajit’ (conquest of the worlds) meaning that which bestows mastery over the three worlds. From out of the sacrificial fire arose a golden chariot, armor and a coat of arms. Having special weapons, he set out on a `Digvijayam’ (Conquest of all the directions). With the help of “Sukracharya”, his teacher and mentor the Lord Sukiran, his preceptor, he conquered Indra and Devas and occupied Indra Logam, the capital of Indra. Brihaspati (Lord Guru Bagavan), the Deva Guru counseled Indra to wait. Nothing could be done and Mahabali would fall only if and when Sukracharya cursed him for disobeying his command – a situation that could be created only by Lord Vishnu. Kaasyapa Rishi had another wife by name Aditi who was the mother of Devas. As the eviction of Devas took place at a time when Kasyapa had gone out for meditation, she awaited his arrival. And, when he returned she narrated the happenings. Kasyapa and Aditi performed a `Payovrata’ – (penance for 12 days when the sacrificers could drink only milk). This was done to propitiate Lord Vishnu. Lord Vishnu was pleased and appeared before them and told that he would be born as the youngest son of Aditi and would help in restoring the glory of Indra. Accordingly he was born during a bright fortnight of the month Bhadrapada. The baby immediately grew up to be a short statured Brahmin Brahmachari (unmarried Brhaman) called Vamana. Vamana Avatar of Lord Vishnu: This Brahmachari entered the sacrificial grounds of Bali who was performing Aswamedha (horse sacrifice). He was resplendent and shone like a thousand Suryas. Bali was amazed, received him with due honors and requested what he wanted – cows, elephants, horses, gold, chariots and promised that he would give whatever Vaamana wanted. Vaamana said that he did not desire any of these but wanted that much of land as measured by three steps by his feet. Bali readily agreed and asked his wife to bring water in a Kamandalam for giving the Dhanam by pouring water in his palm. His Guru, Sukracharya realized that it is only Lord Vishnu who had come in the garb of a Brahmachari and prevailed upon Bali to retract from his promise. But, Bali insisted saying that if Lord Vishnu himself were to seek alms from him, there could no greater glory for him and he would not retract. Sukracharya took the form a bee and stopped the flow of water from “Kamandalam” through which Bali poured water to give his Dhanam. But Bali put a grass “Dharbai” and cleared the way. While doing so Lord Sukiran lost his vision as the Dharbai spoiled his Eyes. Lord Sukran became angry and cursed him that he would soon fall from his high position. And, Sri Vishnu was waiting exactly for this moment. Vaamana grew and grew so tall that all those who witnessed were amazed to witness such a phenomenon. Vaamana became Trivikrama and began to measure the three paces. By the first he strode like a colossus and covered the earth. By the second, he measured the Heavens. Lord Vishnu then asked Bali where was he to measure by the third pace. Bali bowed low to Vishnu and prayed Vikrama to place his foot on his head. Lord Vishnu gave Moksha to King Mahabali by pressing his feet over his heads. In Kerala the Onam festival is celebrated to in praise of King Mahabali every year. Lord Sukran after losing his vision came here to seek pardon. He performed Poojas and penanace in this temple and got his lost vision back from Lord Shiva. The benevolent Lord bestowed Sukracharya’s vision. Story of Haradhatha: There is another story of how Vishnu incurred Sukracharya’s wrath. Sukracharya was the son of Brigu Maharishi. Once during a war between the devas and asuras, Brigu Maharishi’s wife, was accidentally beheaded by Vishnu’s chakram (discus). An angry Sukracharya cursed Vishnu. As a result of the curse, He was born as Sudarsanar to Vasudeva, a Vaishnava Brahmin. Sudarsanar was a staunch Shiva devotee and was popularly known as Haradatta Shivacharyar. There are stories of the ordeals undergone by Haradatta to prove his devotion for Shiva. Images pertaining to these are seen in this temple and also in the Vishnu temple in the village. Haradatta used to spend much of his time meditating before the Dakshinamurthy. There is an interesting story associated with the Nandi here. A poor Brahmin was afflicted by pasu dosham because a calf had expired when he threw a bundle of grass at it. The Brahmin as advised by Haradatta offered a clump of grass to the stone Nandi. To everybody’s astonishment, the stone Nandi is supposed to have consumed the grass. It is said that since this Nandi is eating the grass the tongue is not seen hanging outside. Sukracharyar was imparted the knowledge of “Amirtha Sanjeevini Mantra” by Lord Shiva. This Mantra can bring the dead back to life. Sukracharya used this mantra in one of the deva-asura wars and revived the slain asuras. One being approached by devas for help, Lord Shiva is said to have swallowed Sukracharya in a fit of rage. Sukracharyar meditated on Shiva inside His stomach. Karpagambal prevailed on Shiva to let Sukracharyar out. Hence Sukran is very devoted to the Ambal and is Her favorite. Lord Shiva also conferred on Sukracharya the status of a celestial planet here. There is no idol for Sukran here. Shiva blesses those who come with their prayers to Sukran. 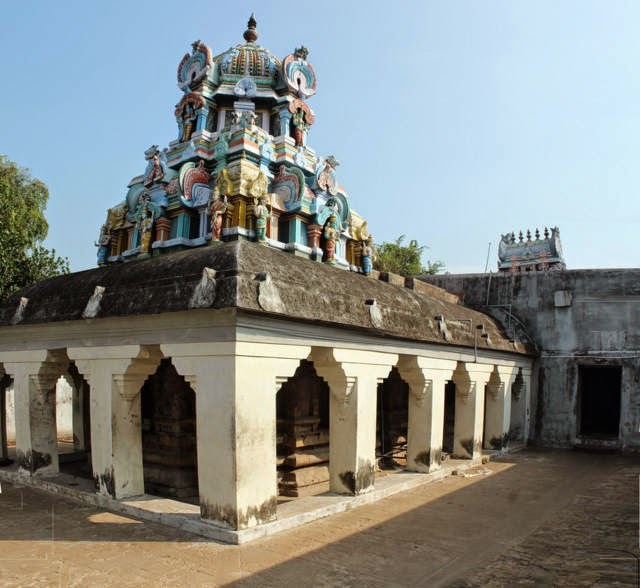 Location: This sivasthalam can be reached from Aduthurai which is located on the Kumbakonam - Mayiladuthurai road. Tirukanjanur can be reached from Aduthurai via Tirumangalakudi. 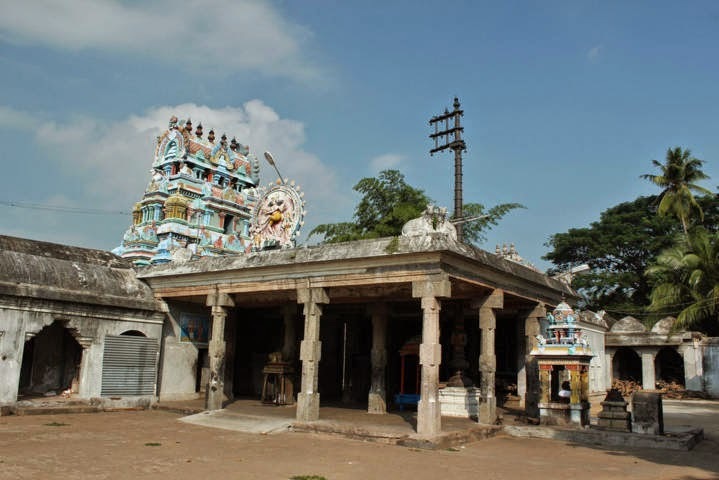 It is just 3 Kms from Suryanar Kovil, 5 Kms from Adudurai and about 20 Kms from Mayiladuthurai. Bus facilities are available from Aduthurai, Kumbakonam and Mayiladuthurai. 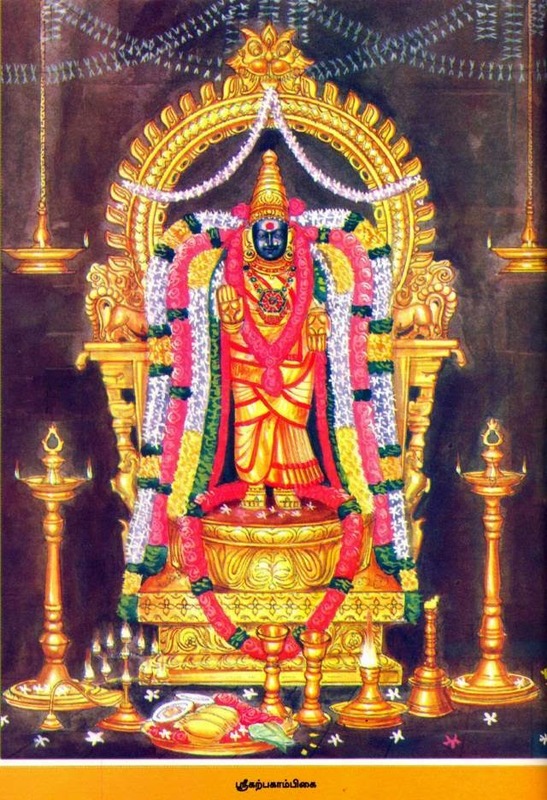 This Shivasthalam is one of the Navagraha Sthalam and is associated with Sukran (Venus).. Thank You Very Much , i am following your site from long back. Great work done which is useful to us. All the best waiting for coming posts. @Naveen - Thank you for your encouraging words.